Medieval Viking Helmets for sale weigh over 6 pounds. 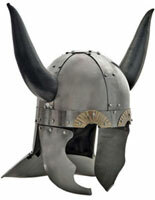 These Medieval Horned Viking Helmets are crafted of heavy 18 gauge carbon steel and include a display stand. They are wearable and feature an interior lining. They have brass colored highlights on the top of the eye holes. The horns are over 17 inches apart from each other and are wrapped with imitation leather. These full sized helmets are almost 18 inches tall. Buy these Medieval Viking Helmets for $79.99.